Science Archives - Solar Love! If you check your calendar today, you might be excused if you thought today is April Fool’s Day after reading this story. Almost as hard as the election of Donald Trump is to believe, this report from the lunatic fringe is even more difficult to give credence to. The UFO hunter known as Streetcap1 on YouTube is putting forth the theory that giant UFOs are draining solar energy from the sun. 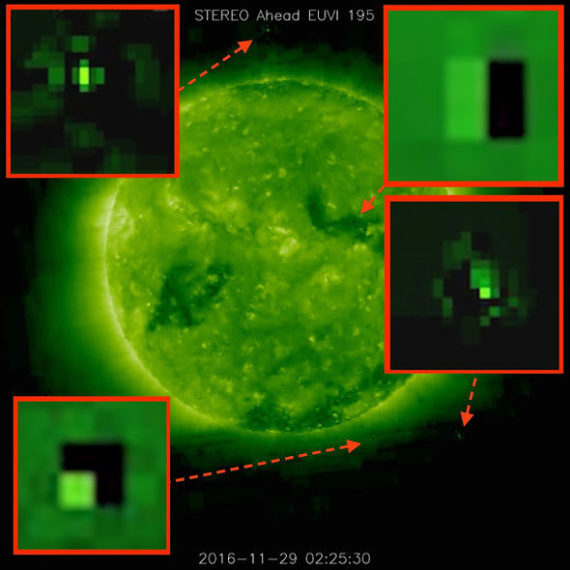 Later, Mr Waring posted his own NASA image taken by the Solar and Heliospheric Observatory (SOHO), a spacecraft with telescopic camera sent to image the sun and beam back high detail images. He says it shows huge UFOs orbiting the sun. 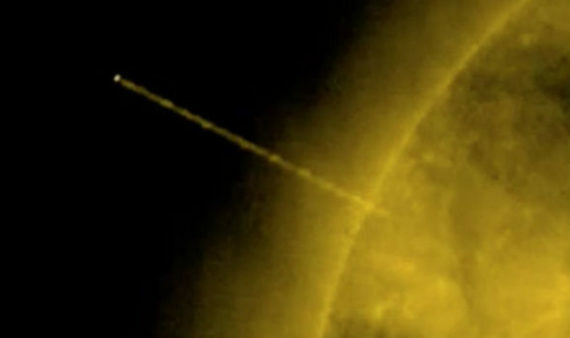 On his website ufosightingsdaily.com, a post entitled ‘Hundreds of Giant UFOs Orbiting Our Sun, NASA/SOHO Images Confirm’, Waring suggested the UFOs are as big as the Earth in some cases. 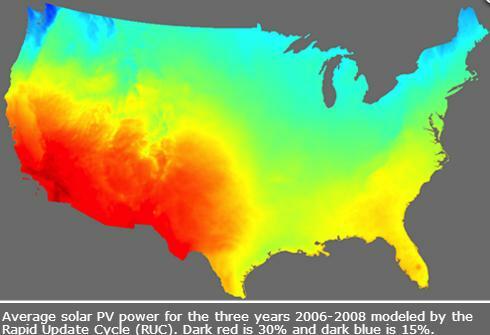 In the model, renewable energy generation potential is examined by the analysis of 152,000 NOAA weather data grid points in the continental United States and beyond, including all hours of day from 2006 through 2008. Some folks who are concerned about the cost of renewable electricity increasing their utility bills might be relieved to hear this: “the model produces power at 8.5 to 10.2 cents per kilowatt hour, less than current national average residential costs of 12.3 cents/kWh (from the Energy Information Administration).” So, a big reduction in climate change emissions and lower costs — what’s not to like? FAQS for the study are here. Of course, models are not the real world and they are useful in controlled, virtual contexts. The crux of the findings seems to be a counterpoint to the doomsday discourse that seems to be common at times. With steady investments in renewable energy, better grid systems and energy storage, climate change emissions could at least be decreased to some degree and any progress would be welcome. As the saying goes, there ain’t no such thing as a free lunch. You can’t generate usable energy without some form of impact, whether it’s fossil fuels or renewables, and the Volkswagen “clean diesel” scandal provides ample evidence that technology solutions for fossil fuels are reaching their limit. 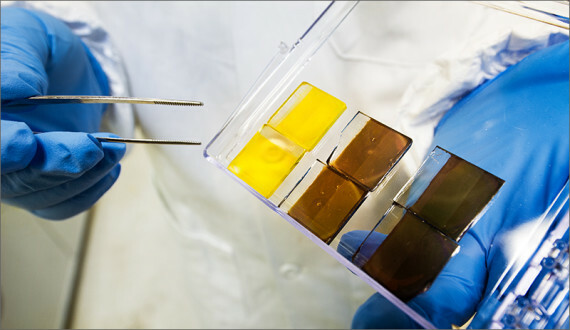 In contrast, a new “green” thin-film solar cell study by Oak Ridge National Laboratory in the US demonstrates that solar energy has ample wiggle room to earn its clean cred. While solar energy is renewable, creating the goods needed to harvest that energy involves impacts all along the supply chain, from mining to manufacturing. We’ve been spilling a lot of ink on thin-film solar cells partly because, although their solar conversion efficiency can’t match conventional silicon solar cells, they involve a highly efficient manufacturing process that cuts costs and helps to reduce lifecycle impacts. What has escaped our attention — our bad — is that the typical thin-film solar cell manufacturing process involves solvents, which are generally toxic. Well, group hug for all you US taxpayers. 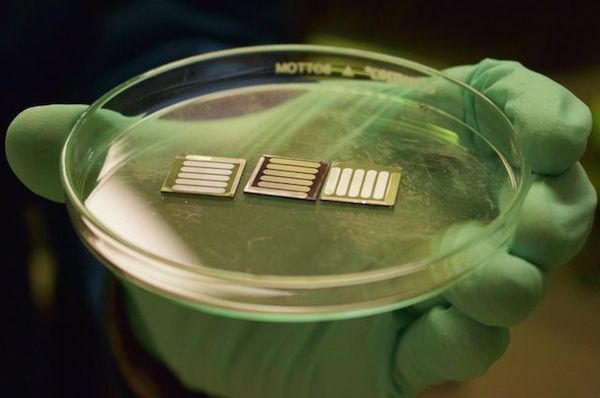 The new thin-film solar cell study from Oak Ridge National Laboratory (ORNL) indicates that the industry could transition out of its dependency on toxic solvents in favor of a more environmentally relaxed solvent called a surfactant, which is fancyspeak for detergent. If you’re up for it, you can find the study under the title “Controlling molecular ordering in solution-state conjugated polymers” in the aptly named journal Nanoscale. 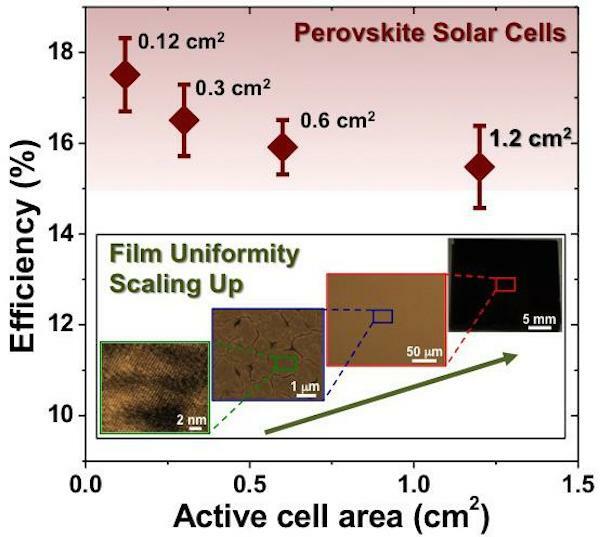 As described by ORNL, in the manufacturing of conventional thin-film solar cells, toxic solvents are deployed to shepherd molecules of polymers (that’s fancyspeak for plastics) to form nanoscale films. That’s 1,000 times thinner than your hair, for those of you keeping score at home. To come up with a non-toxic alternative, the ORNL team designed a unique new polymer with a water-repelling “backbone” and water-attracting side chains. The next step was to put the tailor-made polymer into a solution with a non-toxic surfactant. Like the new polymer, the surfactant also had both water-repelling (hydrophobic) and water-attracting (hydrophilic) ends. In other words, the surfactant arranges itself in a series of tiny stamps — kind of like nanoscale cookie cutters — that determine the shape of the polymer. Zhu further notes that the team was able to confirm its findings accurately because the researchers measured the effect of the surfactant in situ (fancyspeak for “in place”), instead of isolating the material or altering their tests. Accurate in situ measurements can be extremely difficult — think of the difference between measuring the length of an eel while it’s swimming, compared to pinning it out on a board. For its delicate nanoscale task, the ORNL team designed a test chamber that enabled the use of optical probes while the surfactant was busy doing its work. That’s just for starters. Along with the spallation, you have your deuteration, which is a method for depositing heavier atoms into the polymer. That makes it easier to pick out contrasts, which helps to define the structure accurately as it evolves over time, from a solution to a solid. In addition to defining the structure, the test chamber enables researchers to monitor the changing state of the material in real time when exposed to different conditions, including the type of solvent and the temperature, pressure, and humidity. Don’t run out to Home Depot just yet to get your greener thin-film solar cells. So far, the research team has tested the new non-toxic self-assembly method under increasing temperatures. The next step is to do pressure tests, among other things. 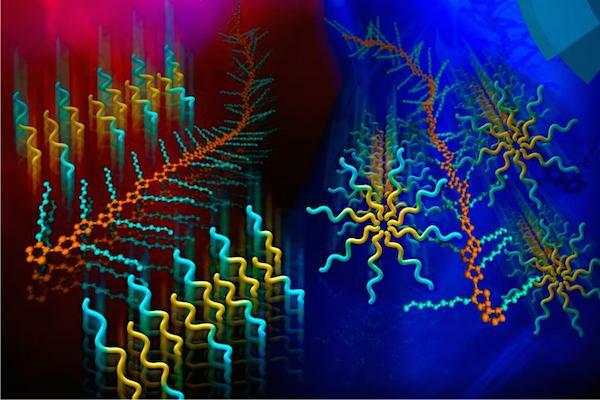 Image: “A surfactant template guides the self-assembly of functional polymer structures in an aqueous solution” by Youngkyu Han and Renee Manning, via Oak Ridge National Laboratory.